This is a beta release of Cloud Datalab Auto Shutdown. This feature might be changed in backward-incompatible ways and is not subject to any SLA or deprecation policy. This feature is not intended for real-time usage in critical applications. 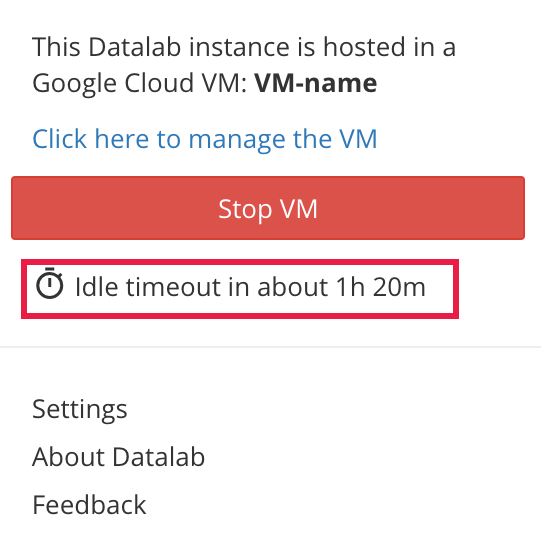 The Cloud Datalab Auto Shutdown feature will shut down the user's Cloud Datalab Virtual Machine (VM) instance after the VM has been idle for a user-configurable period (the default idle timeout period is 90 minutes). Shutting down the VM when it is no longer needed can help reduce Google Cloud Platform Console usage charges (see Cloud Datalab Pricing). Note that Cloud Datalab does not guarantee auto shutdown. It is the user's responsibility to ensure that the Cloud Datalab VM is shut down. As a default, the Auto Shutdown timer starts counting down with a value of 90 minutes. The Cloud Datalab Account account_box menu shows the approximate amount of time remaining before the Cloud Datalab VM will be shut down. The timer remains reset while a notebook is open and busy (running code in a cell). You can disable the timer by clicking on the idle timeout message in the Cloud Datalab Account menu. To reactivate the timer, click on the message again. If you disable the timer, it will remain disabled until the VM is shutdown by other means, then rebooted. You can also disable the timer as explained in Changing the idle timeout period). The default idle timeout period is 90 minutes. You can change this value by opening the Cloud Datalab Account account_box menu, selecting Settings, then filling in a new value for the idle timeout period and clicking Update. The updated value is saved, and is preserved when the VM re-boots. The interval in the Settings dialog can be specified using time units of seconds, minutes, hours, or days, in singular or plural form, or using only the first letter of these units. Values are integers, and multiple units can be mixed—examples of valid interval values: "30m", "2h45m", "3 days", "1 day 10 h 30min". The minimum valid interval (other than 0, to disable the timer as explained below) is 60 seconds. You can disable the timer by entering a 0 value (the timer stays disabled after a VM reboot). Note that when the timer is disabled from the Settings dialog, the idle timeout message in the Cloud Datalab Account menu will not appear (you will not be able to re-enable the timer from the Account menu as explained in Disabling the Auto Shutdown timer). To re-enable the timer, you must re-open the Settings dialog, then update the idle timeout interval with a non-zero value.